Lynsted is a village in Lynsted with Kingsdown civil parish in the Swale borough of Kent, England. 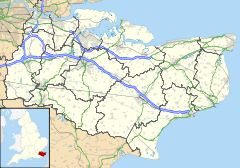 The village is situated south of the A2 road between Faversham and Sittingbourne and the nearest M2 junction is Faversham three miles east. Lynsted is in many respects an archetypal old English village with church, churchyard with an ancient yew, pub (the Black Lion) and a duck pond. The parish's southern part is on the north slope of the North Downs; Bluetown, Kingsdown is at 104 m above mean sea level and Erriottwood at 67 m. Its extent stretches from, in the north, the Roman road Watling Street, later named Greenstreet and now named London Road, where the hamlets south of it are Cellarhill or Cellar Hill and Claxfield (that borders across the road Teynham) to, in the south, Erriottwood. Bogle in the north-centre and Tickham in the east are the two other hamlets, within ​1⁄4 mile of the centre. The land drains well with chalks of the North Downs. Although not featured in the Domesday the closest featured location is Milton Regis. There is a church to St Peter and St Paul with the highest, grade I, architectural listing status. It is a 14th-century broach spired church, with 13th century features and its chancel is 16th century. The monuments include the south Roper chapel to Sir John Roper, 1st Baron Teynham, d.1618 brass chandelier dated 1686; brasses to Elizabeth Roper, d.1567, to John Worley, d.1621, 2 foot figures; painted alabaster with stiff recumbent knight with his Lady on a marble sarcophagus; a son and two daughters kneel on a panel to rear in coffered niche with architectural surround, with corinthian capitals, dentil cornice, obelisks and cartouche. Lord Christopher Roper, d.1622. signed by sculptor Epiphanius Evesham subtitled 'Me fecit': plaster figures of reclining and dying knight draped with his ermine cloak, with his kneeling and mourning wife behind him. He lies on a sarcophagus with central inscription flanked by carved panels of 2 sons, their backs turned to their hounds and hawks, and 5 daughters and granddaughters; the north Huggeson chapel to Catherine Drurye (née Finche) d.1601, alabaster hanging monument with kneeling couple facing each other, children behind, with bracketed base; monument to John Huggeson d.1634; Josiah Huggeson, d.1639; James Huggeson, d.1646 (recumbent man and wife on bolection moulded sarcophagus); Rudolph Weckerlin, d.1667; Anne Delaune, d.1719; Martha Huggeson, d.1753; William Huggeson, d.1774. From this is can be seen that the Huggeson and Roper families were among the wealthiest landowners from at least the 16th century; they developed their dedicated chapels with artistically acclaimed monuments. The village centre is a conservation area containing 24 listed buildings. ^ "Domesday Extracts postcode finder". Archived from the original on 28 April 2014. Retrieved 4 May 2012. ^ a b Historic England. "Details from listed building database (1069393)". National Heritage List for England. Retrieved 4 May 2012. ^ "The National Heritage List for England". English Heritage. Archived from the original on 1 May 2012. Retrieved 4 May 2012. ^ "Parish council members". Lynsted and Kingsdown Parish Council. Archived from the original on 3 March 2016. Retrieved 4 May 2012. Wikimedia Commons has media related to Lynsted. This page was last edited on 15 December 2018, at 16:13 (UTC).